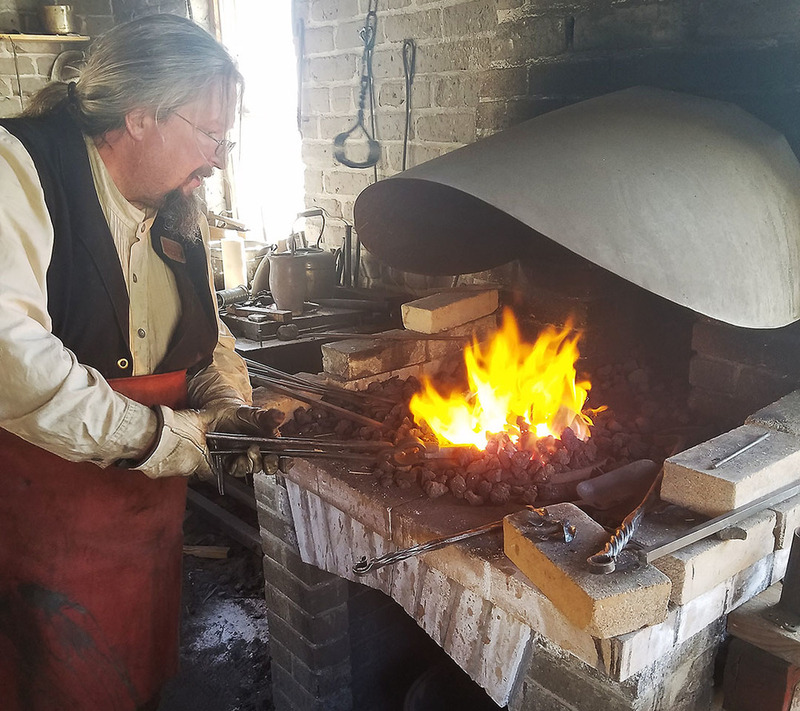 Johnny Appleby is forgewelding the handle of a soldering iron for tinsmithing work at "This is the Place" Heritage Park in Salt Lake City, Utah, in April 2016. Appleby, an art teacher at Blytheville Primary School, was recently chosen as a member of a "distinguished group of craftspeople that are listed in the 2018 Directory of Traditional American Crafts" in the August edition of Early American Life. Johnny Appleby is a “natural” as an art teacher at Blytheville Primary School. His hobbies are many and varied, so much that he is able to instruct his young students on at least the very basics of several topics. Appleby is also an accomplished craftsman, and he was recently recognized in the edition of a magazine that is dedicated to colonial era interests. Appleby, 49 and a 1988 graduate of Clinton, Ark., High School, was recently chosen as a “distinguished group of craftspeople that are listed in the 2018 Directory of Traditional American Crafts” in the upcoming August issue of Early American Life. The magazine is dedicated to preserving the traditional crafts of the colonial era. Appleby, who teaches art to both the primary and kindergarten students, relocated last summer from the Salt Lake Valley in Utah, where his family had lived for several years. He worked as a blacksmith and traditional tinsmith at Heritage Park in Salt Lake City. Gradually acquiring the skills and craft of a tinsmith, Appleby learned to make nearly everything that is needed in the home. “I made things such as lanterns, candle holders and candle molds,” he stated. “I’ve also created boxes of all kinds, from very small boxes to large ones. Appleby worked as a historical craftsman and park interpreter at “This is the Place” Heritage Park in Salt Lake City. The park hosted school field trips in the spring and fall, and the remainder of the time he was a craftsman and interpreter in various sites throughout the park. His hobbies range from experience as a photographer and print maker to that of a painter. Appleby sometimes makes jewelry; he also hunts and fishes and considers himself a pretty good cook. He has also used his talents as a tinsmith with students, as he did at the April 17 “Evening with the Arts”, when he took sheets of tin and created roses and cups (citing Heritage Park visitors, Appleby sometimes refers to himself as the ‘Cup Guy’).